This week’s dinner is brought to you by a fit of industrious fridge clearing, and by a subtle and very precise craving. Plus, I know what’s for Dinner next week, and trust me when I say a week’s worth of abstemiousness in advance is a good idea. The Fall fridge clearing is, I suspect, an urge born of the fact that it’s much easier to accomplish than getting out my winter clothes (plus, does not require me to admit that we’re approaching winter – never mind that we caved on Monday to Mother Nature and turned on the heat*). Also, it makes me feel virtuous and thrifty. The Chicken Tortilla Soup managed to use up the stack of corn tortillas that were left over from a dinner of inauthentic (but tasty) huevos rancheros last week; the languishing remains of two quarter heads of cabbage from the Blue Cheese Cole Slaw; and some bone-in chicken breasts that didn’t get roasted two weeks ago when I made Moroccan Roast Chicken and were taking up space in my freezer. I can’t say that my freezer is now empty (I’ll wait while certain segments of the population stop laughing at the very concept of my freezer being empty), or that my crisper drawers are bare. However, I can say that my crisper drawers are full of fresh new produce and not limpid remains of anything, and there was a very brief period between late Friday evening and Saturday afternoon when I could legitimately say that my fridge was bare-ish. The subtle and precise craving I have been experiencing for a cornmeal product that is not cornmeal or polenta is less easy to explain. I tried to assuage it with a blue corn flapjack at The Town Diner last Thursday, and while that was tasty (because really, it was covered in butter and maple syrup and when is that ever bad?) it did not quell my craving. I finally decided that what I wanted was something that would have an identifiable crunch of cornmeal without being as dry as a Southern cornbread; and something that would embrace the sweetness of cornmeal without being as heavily sugared as a Northern cornbread. What I wanted, I finally determined, was a savory scone. In defiance of the laws of the internets, epicurious, myrecipes and foodblogsearch all failed me in my quest for a recipe that would satisfy my yen. I found savory scone recipes. I found unsweet corn muffin recipes. I found cheesy biscuit recipes. But nothing could I find that combined all of those things in to one neat handheld package that I could split open and slather with butter. 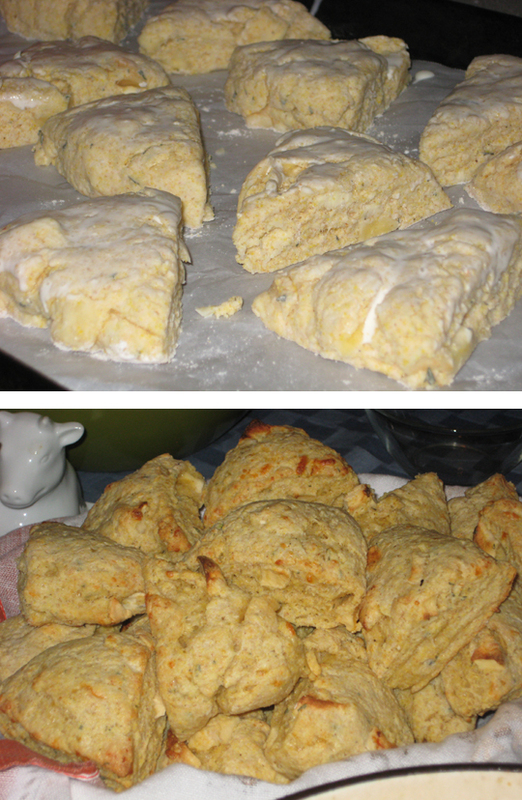 In desperation I took an unprecedented step and cobbled together a recipe that included elements of the savory scones, the corn muffins and the cheesy biscuits. What I came up with is mostly a scone in name only; it’s definitely not a muffin, and probably closest to biscuit dough, but I cut them to look like scones so that’s what I’m going to call them. Then, because I’m not a fool, and more relevantly, not a baker, I emailed the recipe I’d come up with to a friend who has an actual degree in pastry science and asked if it would rise, hold together, and generally do all the things one wants a baked good to do. She said she thought it would, so with trepidation I mixed and rolled and baked. Verdict? Very very tasty. The cheese flavor came through, the cornmeal gave the scones a little texture without being gritty, and the buttermilk kept them from being too rich. All in all I’d call this a win. * Yes, more than a week before the Zuidlaardermarkt; but on the other hand it was 59 degrees in my apartment last night and there’s only so much I’m willing to suffer. A few nit-picking notes, more for my future reference than anything else. – Perhaps a hair more salt to bring out the flavor of the cheese (although if you used a saltier cheese like a parmesan or an aged gouda this would probably not be necessary). – You could substitute fresh apples for the dried if you wanted, and perhaps up the quantity to 2/3 cup for either (or soak the dried apples in apple cider for a more pronounced apple flavor). – These would be awesome with apple butter. Preheat oven to 425°. Cover baking sheet with parchment paper. 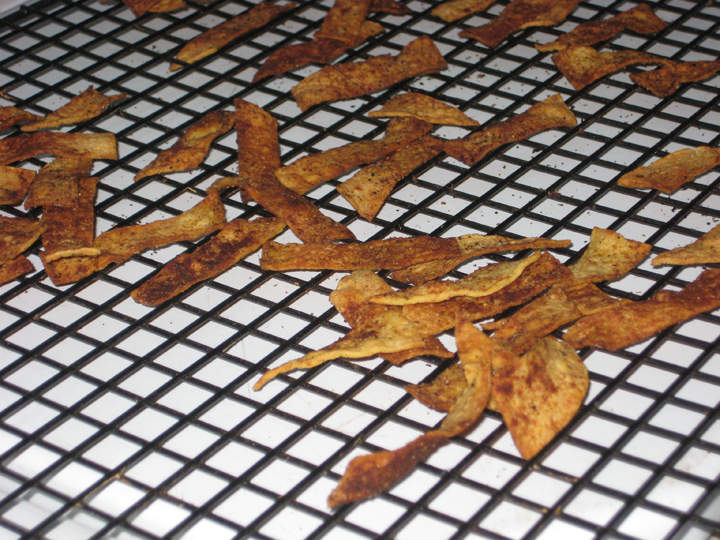 Cover dried apples with boiling water (or very hot tap water); let stand for 10-15 minutes. Drain well and pat dry on a paper towel. Sift together the dry ingredients; cut in butter until mixture resembles coarse meal. Stir in cheese, and then chopped apples. Add buttermilk, stirring just until moist (dough will be sticky). Turn dough out onto a lightly floured surface; knead lightly 4 times with floured hands. Divide dough in half. Pat each dough portion into a 6-inch circle and cut each circle into six wedges. Brush with a little milk or cream. Bake at 425° for 12-15 minutes or until golden brown.